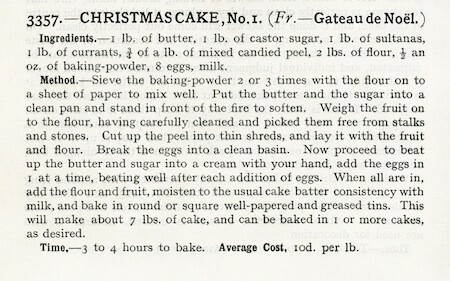 A rich fruit cake is long associated with Christmas; heavily ladened with marzipan and icing. True traditionalists would add a little brush tree, Father Christmas or even a little snow-covered house. Roll back the clock a bit and they might have been topped with bisque snow babies. Mrs Beeton’s recipe from the late 1800s seems a little simple, even if it did need eight eggs and took three to four hours to cook. It would make a seven pound cake and you could only guess at how many it would serve. ﻿Go north of the border and it was more likely to have been a Dundee cake, arguable the same - although many Scots would disagree - but without the marzipan or icing and likely laced with whiskey and not brandy. Who remembers the yellow and gold tins a Lyons Dundee cake came in ? 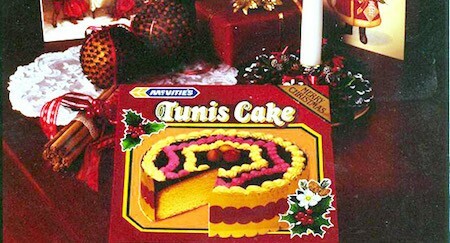 But rich fruit cakes are not to everyone’s taste and in the 1930s Scottish bakery Macfarlane Langs produced a Tunis cake: A madeira covered in a slab of chocolate, it was decorated in brightly coloured marzipan fruits and often icing swirls. Merging with McVities postwar, the cake was popular in the 1970s before disappearing from the shelves the following decade. But a straw poll amongst colleagues failed to reveal anyone who had ever heard of it ! Far more familiar is the chocolate Yule log. A step up from an ordinary chocolate Swiss roll, it appears to be an invention of the 1960s when Cadburys wrapped their roll in a coating of chocolate bark and adorned it with a foil Merry Christmas and a little robin. Even Blue Peter tempted children to produce one: This time with chocolate biscuits sandwiched together to form a log and generously smothered in chocolate butter cream. Both logs would be amply dusted in icing sugar to complete the wintery scene. These days we are more likely to be tantalised by the marzipan-filled German Stollen or the simplicity and subtlety of the Italian Pannetone. But for a real contemporary centre piece, you would be hard pressed to beat the Scandanavian Kransekake towering above the Christmas spread like this one baked by Paul Hollywood.